Did you ever think that learning Biblical Greek could be fun? And funny? Have I got a product for you. It's Not GRΣΣK to Me, this month's Moms of Master Books review product, is a simply fabulous introduction to Biblical Greek. We used it along with the accompanying Parent Lesson Plan, which provides some worksheets and some direction for high school students especially. This is meant to give you just enough Greek to be dangerous, and can be used to get you ready for a first year Greek class. 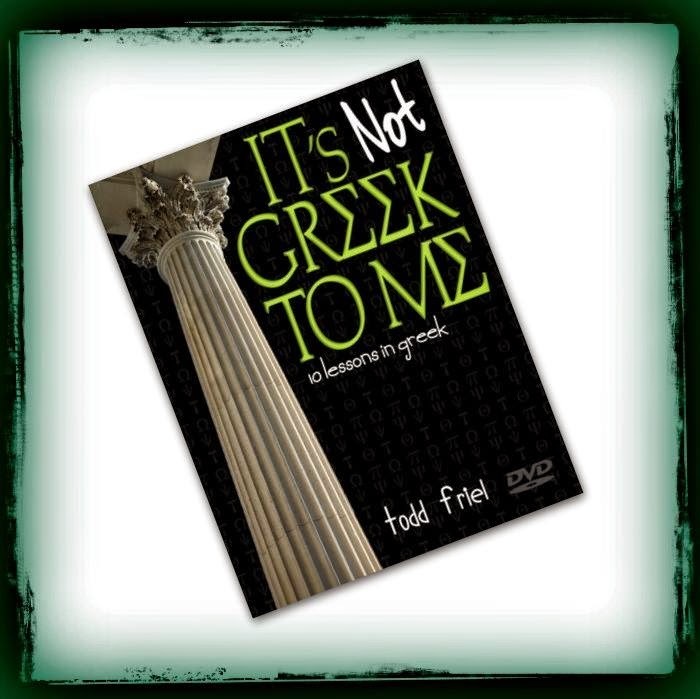 The goals of this 10-lesson DVD course are to make it so that you understand how Greek works, read the words, and understand the basics of the grammar. The recommendation is to get an Interlinear Bible and use that, once you finish this course. What you are not doing? You aren't memorizing vocabulary lists. You aren't learning big long lists of conjugations (verbs) and declensions (nouns), but you do know what that means. You aren't trying to translate from English into Greek. You aren't getting hung up on "proper" pronunciation (since we don't have tape recordings anyway, so "proper" is really just an educated guess). Todd Friel (he likes to be called Mr. Friel) is lots of fun. In a geeky way. He doesn't take himself too seriously, which is great, so when he trips over a sentence as he is filming, he laughs at it and corrects himself and moves on. I love that with video courses. It sends a great message to perfectionistic kids (here's a great product that could have been perfect, but Mr. Friel is okay letting you see that everyone makes mistakes). It also sends a great message to kids who have a tendency to make stupid little mistakes (here's someone who also makes mistakes, only he doesn't beat himself up over it). The only thing this course has you memorizing is the Greek alphabet, and some punctuation types of things. I like that. Connor thinks this would have been fabulous to have done before he took a semester of Greek. William and I find it pretty easy to follow as well, and think it is going to be a great help in Bible study. Mr. Friel is really good at looking at the camera. This isn't just a "set up the camera in the classroom" style. Multiple camera angles, and he always seems aware of which one he is talking to. The DVD can be used by itself for adult or teen study. The Parent Lesson Plan can be used if you want a bit more schoolish types of work, or if you want to make this a half-credit for high school. There are a few points where the camera angle makes it rather difficult to make out what is written on the chalkboard. There were a couple of technical glitches, with two lessons that cut off in the middle of what appeared to be the last sentence. You can go see what other Moms of Master Books have to say about this DVD. Disclaimer: I received this DVD and the Parent Lesson Plan for free from New Leaf Publishing Group as part of the Moms of Master Books program. No other compensation was received. The fact that I received complimentary products does not guarantee a favorable review. Huge Sale from Home School Adventure Co.
Odyssey Adventure Club – join today for just $5!